Our bus travels daily from Byron Bay to Nimbin with 2.5 hours in Nimbin before continuing to Uki (Mt. Warning) and back to Byron Bay. Traveling a scenic circuit gives you the chance to enjoy some of the best scenery in this beautiful region. Our service gives you the flexibility to visit Nimbin on a daytrip or stopovers in Nimbin or Uki for the Mt. Warning Trek. On most Sundays we combine the service with a visit to a local market. On the journey we play a mix of music and give you information about the area. 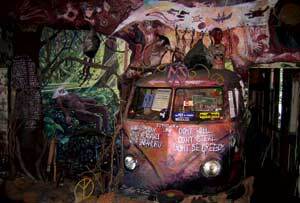 Our local drivers will give you a good insight into Nimbin. We also provide information folders in Japanese, French, German, Italian and Spanish. 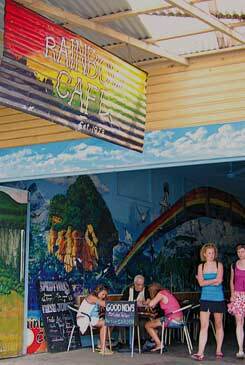 Nimbin has to be seen to be believed with its colourful murals, laid back cafes and famous street scene. 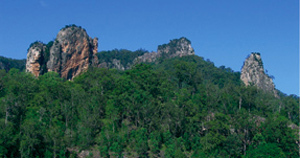 It’s an old dairy town and close to the Nimbin Rocks, one of the most sacred places of the Bundjalung people. After the dairy industry crashed, the "Aquarius" alternative lifestyle festival was held here. Many stayed and bought the cheap land in the hills, forming communes and alternative communities, using alternative home energy systems and farming methods, planting trees and preserving the local forests. Nimbin is the only place in Australia where the alternative is the dominant culture. It’s colourful, unique and very interesting. 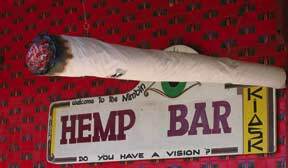 During your time in Nimbin we give you a “Chill or Tour” option. Do your own thing for the whole time, or come along with us for a one hour mini tour that will give you great insight into Nimbin ’s alternative lifestyle, Permaculture and Alternative Energy, Aboriginal Spirituality ( with a photo opportunity of Nimbin Rocks ), Nimbin’s interesting history and culture, plus a short visit to the very colourful Nimbin Candles. After we leave Nimbin we head into the beautiful Mt. Warning Caldera. This is an extinct volcano with some spectacular scenery… steep rainforest clad hills, picturesque green fields and the volcanic plug of Mt. Warning. We have a short stop at Mt. Burrell which has magnificent mountain views as well as giving you the opportunity to buy some cheap farm fresh fruit and vegies at this popular local shop. We stop at Uki to drop off passengers intending to trek Mt. Warning. Just outside the village is another photo stop that in clear weather has a great view of the mountain. From there we head back to Byron Bay and the scenery continues with forest and views from the Burringbah Ranges.